I’ve found that unless you go to a restaurant that caters to vegans and vegetarians, you’ll often end up with food that has bits of meat in it, or some animal-sourced ingredient in the dish. Not intentionally of course, but consider the fact that the cooks are using the same pans, knives, etc. on all meals, so it’s almost unavoidable. This is especially true if you go to a restaurant during busy peak meal hours like 12:00 noon to 1:30 pm, or during the dinner rush at 6:00 to 9:00 pm. With that reality in mind, I’ve taken to learning how to prepare lots of different types of cuisine myself. Since my palate is quite varied and I love Asian food in all forms, I have learned how to prepare Thai curries, Indian curries, African dishes, Filipino and Vietnamese and Japanese food as well. This dish is based on Chinese fried rice, which I grew up eating in San Francisco, home of some of the best Asian restaurants in the country. This is really easy to make and tastes fabulous. The idea came about because my daughter had some leftover Jasmine rice, which had been sitting in the fridge for two days. Rather than throw it out, I decided to make some veggie fried rice out of it. Cause dude, I really HATE wasting food. Here’s a picture of the end result. Look at all those fresh looking vegetables. Yum! There are several tricks to getting your fried rice to look and taste like restaurant quality food. First trick: how to keep the vegetables bright and colorful. The brilliant greens, reds and orange colors are retained by stir-frying the rice separately from the vegetables, so they are not coated or darkened with soy sauce. You’ll mix the veggies and the already cooked and seasoned rice together at the end. Magical. Second trick: make sure your rice has been cooked a few hours to a few days before use, and that it is DRY and COLD. That way when it hits the wok or whatever you use to make your fried rice, it won’t soak up the hot oil but will instead by lightly toasted and retain its firmness. Third trick: make sure you don’t overcook the vegetables and make them mushy. Remember, Chinese style vegetables are cooked only to the point where they are soft but retain a delicious firmness and slight crunch. Pick up a variety of vegetables. Here I used some frozen peas and carrots, and a variety of fresh vegetables – broccoli, red bell pepper, onion, snow peas, bean sprouts, and a few mushrooms that were hanging out in the fridge. 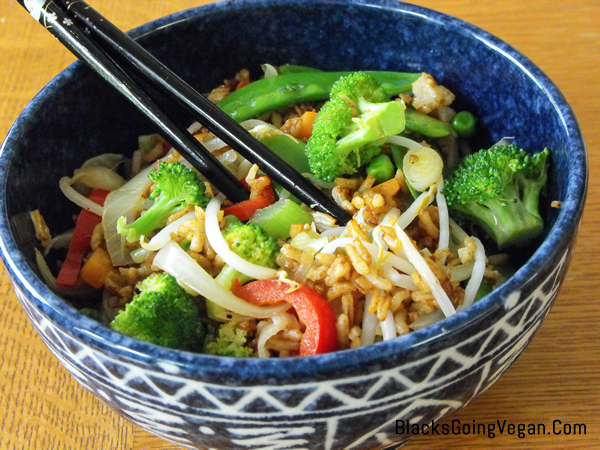 If you want to have extra protein, stir fry or bake some tofu and throw it in when you add the rice to the vegetables. Give it a shot then post your picture and review in the comments section. 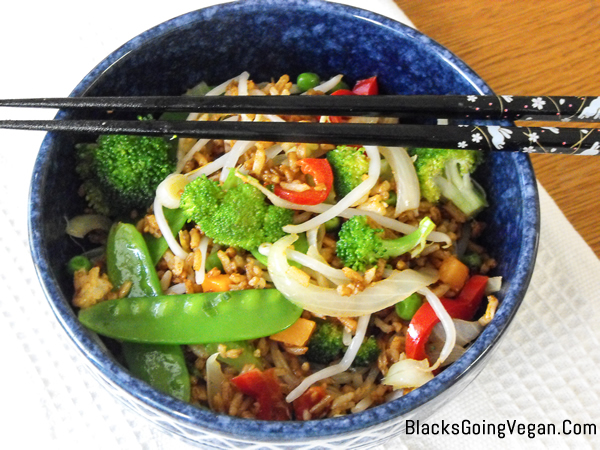 Bursting with fresh vegetables and flavor, this Chinese style fried rice makes a perfect lunch. The cooking process is quick - what takes the most time is chopping and preparing the vegetables. If you do that the day before you can get your meal on the table in under 10 minutes. Wash and prepare your vegetables as set out above, placing them in separate bowls. Line them up within arm's reach of the stove because once you start cooking, there won't be time to run around grabbing stuff from across the room. Add 1 Tablespoon of oil to wok or large frying pan over medium-high heat. When hot dump in the rice (make sure there are no clumps), and stir it around for 20-30 seconds. Add soy sauce and sea salt; stir fry rice mixture for 3-4 minutes. Remove from pan into a bowl and set aside. Wipe out wok and add a little more oil. Add the minced garlic and stir fry about 30 seconds. Add the green onion, onions, and celery and saute for 1 minute. 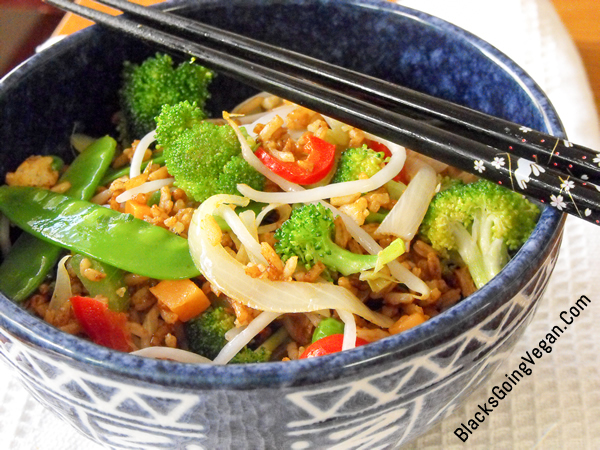 Add the broccoli florets, sprinkle with a shake or two of salt, and stir fry for 2 minutes. Add the mushrooms, snow peas, bean sprouts, peas and carrots and sprinkle with a shake or two of salt. Sir fry another 2 minutes. Add in the pepper powder, sweetening agent of choice and mix into vegetables. Quickly add in the rice and toss well to mix in with the other ingredients. Taste and adjust seasonings as desired. Serve hot with pepper flakes, seasoned tofu cubes, or whatever you like. Vegetarians can add in a couple of scrambled eggs for additional color and flavor. Mix it into the wok before you add the rice and soy sauce. 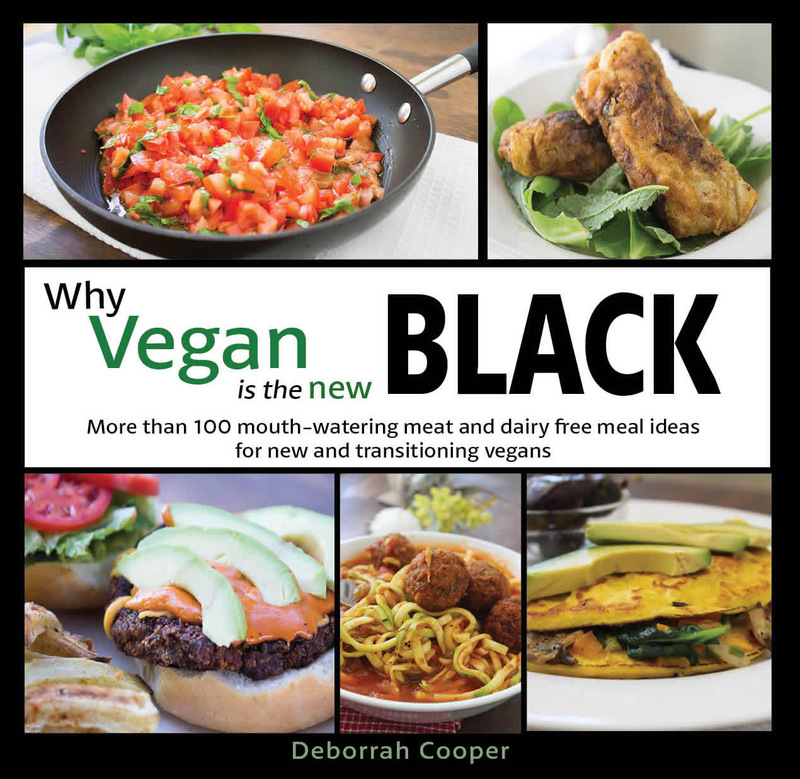 Find more delicious vegan recipes in the exciting new cookbook WHY VEGAN IS THE NEW BLACK. Click graphic below for more information and to order your copy.